Heidi Schultz, Martin Block and Don Schultz (AKA the “Father of Integrated Marketing”) have teamed up to author a comprehensive book on China’s Most Coveted Consumer Group—the Chinese Digital Generation. Drawing on the ProsperChina InsightCenter™, this book presents a clear, practical view of how young Chinese consumers (ages 18-34) act, shop, and plan today and how they will likely do so in the future. China's Digital Generation is driving the country's rapidly changing consumer economy. These savvy young consumers are a powerful force, shaping China's markets now and for years to come. “Understanding China’s Digital Generation” was written for managers of consumer-oriented products and services who are seeking to expand or extend their initiatives into the Chinese market. Many articles, papers and viewpoints have been written about the economic, social and technological advances in China. Few, however, have been written specifically about Chinese consumers—how they shop and buy today, why they are the way they are and what they will likely buy in the future. It’s the most specific, detailed and comprehensive book on China’s Digital Generation ever because it comes from the Chinese consumers themselves through their online responses to extensive questionnaires gathered over the past six years, tracing and tracking the ever moving and ever changing Chinese digital consumer generation. Each chapter is filled with consumer insights and expert analysis, along with five key takeaways marketers can implement tomorrow. Chinese consumers are also compared to their U.S. counterparts, showing similarities and differences. Views of Chinese consumers living in Tier 1, Tier 2 and Tier 3 cities are also compared and contrasted. In a final note, the authors summarize six areas of marketing opportunity for the future. The Chinese rely heavily on the Internet to stay in touch with friends, families and associates. So do Americans, but the tools are quite different. The Chinese rely on instant messaging (54.5% say they chat via IM for fun and entertainment, compared to 32.8% of Americans). On the other hand, 35.2% of young US residents use online communities whereas 23.6% of young Chinese do the same. There is no dominant major social network in China similar to Facebook in the U.S. Instead the Chinese rely on special interest networks such as Sina Weibo, Youku/Tudou and Renren, all of having their own specific purpose. Online shopping is booming in China, but only recently. Nearly 65% report regularly purchasing products online, increasing nearly 20% over the last two years. Lack of trust, payment facilities and logistics, all of which are prevalent in the U.S., are just now being overcome. There are major differences in how and in what way the digital tools are used in Tier 1, Tier 2 and Tier 3 Chinese cities. Much like the differences in U.S. digitals between New York and Los Angeles and those in Racine, WI and Big Spring, TX. View additional key findings on the Prosper Now blog on Forbes.com. “The Chinese digital generation is undoubtedly the most unique group of consumers in the world. Raised after the cultural revolution, mostly products of the ‘one child policy’, raised on digital and interactive media, living in and through the greatest people migration in history, this group of Chinese consumers will have more impact on the future of marketing than any generation in history.” That’s how the authors summarize their work. 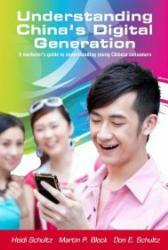 For more information about “Understanding China’s Digital Generation,” please visit: http://www.goprosper.com/chinabook/. You can also call: 614-846-0146.